I have a friend who has a theory that Tom Cruise has been replaced by a clone due to his seeming inability to age. Love him or hate him for a man a few years shy of his 60th birthday he looks great. And to be making high octane movies such as this and performing his own stunts is a physical accomplishment at any age. And make no mistake the action and big set pieces so associated with the MI movies hasn’t been pared back to allow for his advancing years. If anything they have increased in intensity. You know the score at this stage. 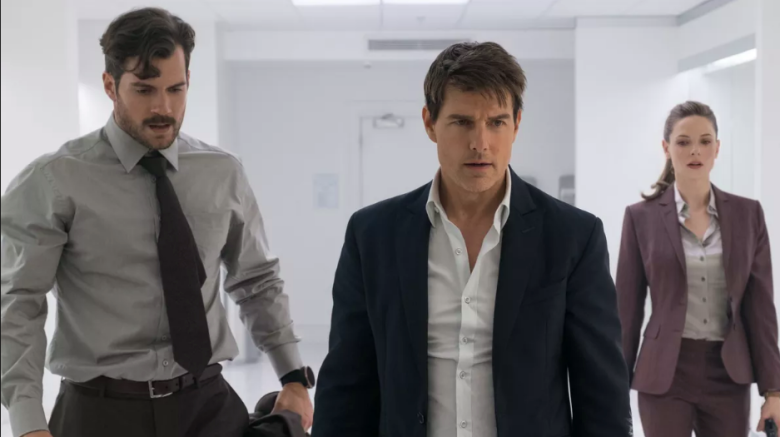 There’s a bad guy who wants to destroy the world and it’s left to Ethan Hunt (Cruise) and his team of IMF agents to stop them. This is no different. Spanning several countries and featuring numerous high octane chases, lots of shots of Cruise running (somewhat of a staple of every movie he does), adrenaline filled combat scenes, breath-taking aerial scenes and some gasp inducing set pieces, this is classic MI dialled up to 11! This picks up shortly after the last movie but you don’t need to have seen that to enjoy this. There is enough exposition to bring you up to speed. As I said the plot is pretty standard fare – what makes these movies special is the action sequences. Historically they have thrown everything but the kitchen sink at them and here even that is included. They are bigger, brasher and bolder than before. There is a spectacular chase scene through Paris involving all manner of vehicles from speedboats to motorbikes. There is an impressive chase on foot across the rooftops of London and there are some stunning fight sequences. Princess Margaret herself, Vanessa Kirby, kicks some serious backside early on (although becomes little more than window dressing after that). The female contingent are also represented by Rebecca Ferguson in her second MI outing. She more than holds her own with the men but there is a sense that she’s the token female in the team. Under representation of women has always been a flaw in the MI movies and it is no different here. Gender politics aside the script contains plenty of wit and sparkle – much of it brought to life by the brilliantly deadpan Simon Pegg. This humour transposes nicely with the intensity of the big blow out scenes giving it that extra edge. The final sequence will have you on the edge of your seat. There are at least 16 points in which Cruise’s character probably would have died in real life! If you suffer from vertigo you may want to look away for this part – just saying. This puts the possible in impossible. It is well paced and doesn’t outstay its welcome and it will leave you with your heart beating faster than when you entered the cinema. Yes, it’s more of the same but if it ain’t broken don’t fix it and all that. And they’ve upped the ante enough to make this instalment seem as fresh as the first one. If you’re looking for a couple of hours of thrilling escapism then this is the movie for you.